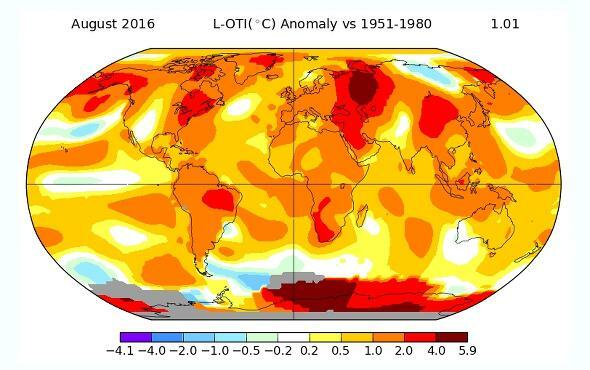 August 2016 was the hottest August on record. No human alive has seen a March April May June July August like this before. N.B. If this article sounds familiar, it should. This has been happening so frequently I just copied the post for March April May June July and updated it. October. November. December. January. February. March. April. May. June. July. And now August. For the sixth seventh eighth ninth 10th 11th month in a row, we’ve had a month that has broken the global high temperature record. According to NASA’s Goddard Institute for Space Studies, March April May June July August 2016 was the hottest March April May June July August on record, going back 136 years. It was a staggering 1.28°C 1.11°C 0.93°C 0.79°C 0.84° 0.98° C above average across the planet. * The previous March April May June July August record, from 2010 2014 2015 2011 2014, was 0.92° 0.87° 0.86° 0.78° 0.74° 0.82° above average; the new record beats it by well over a tenth of a degree. What’s going on? El Niño might be the obvious culprit, but even earlier in the year when it was strong it was only contributing a small amount of overall warming to the globe, probably around 0.1° C or so. That’s not nearly enough to account for this. Also now, even though the Pacific waters have returned to more neutral conditions, we’re still experiencing record heat. 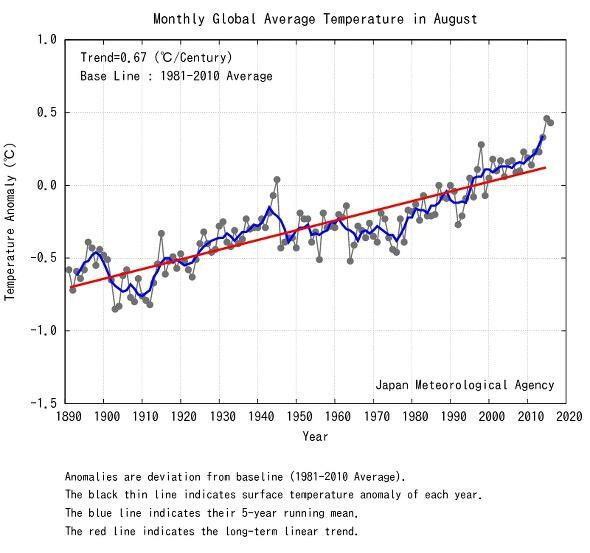 The Japanese Meteorological Agency measured similar temperatures as GISS (though it uses a different baseline for the average). Note the trend. See a “pause”? I don’t.